I've seen a lot of these on etsy but wouldn't it be great to make one for yourself with some scraps? 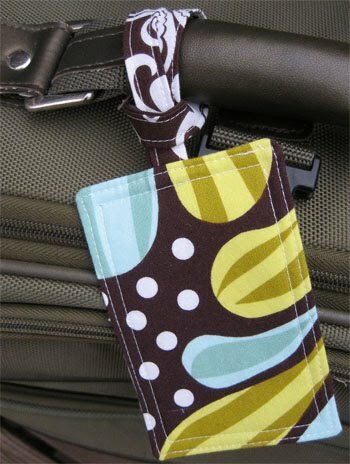 Check out Skip to My Lou's Luggage Tag Tutorial. Makes any boring vinyl rolling suitcase POP! These would be great for the kids' backpacks too! Can't wait to check out the tutorial! Oooo, thank you! I've been looking for something like this. Our luggage tags are falling apart and I can't bring myself to pay $10 each for ugly ones! I was just visiting your blog drooling over all of your amazing ideas and talent and saw my luggage tag----- just so honored and flattered to be on your blog! Thanks for all of your wonderful ideas. Your blog is a dream!